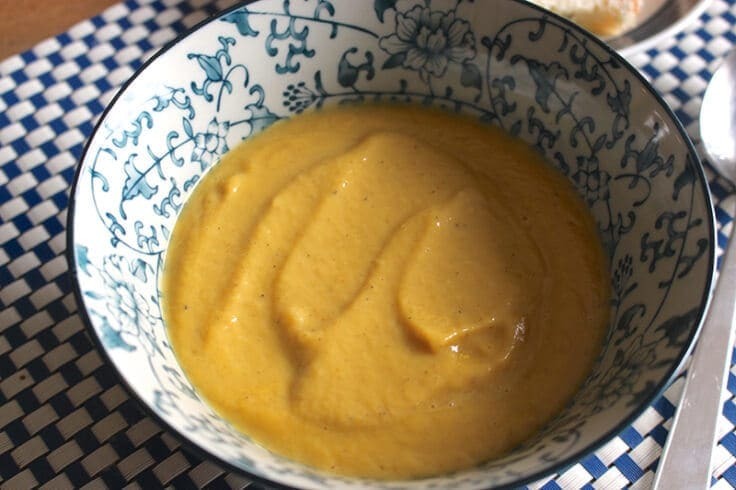 This delicious, savory Slow Cooker Butternut Squash and Parsnip Soup recipe is sure to warm you up on a cold winter night. 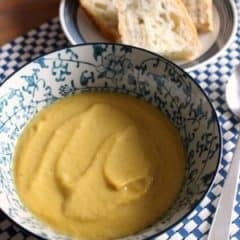 Slow Cooker Butternut Squash and Parsnip Soup is delicious served with freshly baked bread and a salad for a complete meal. Hi there! 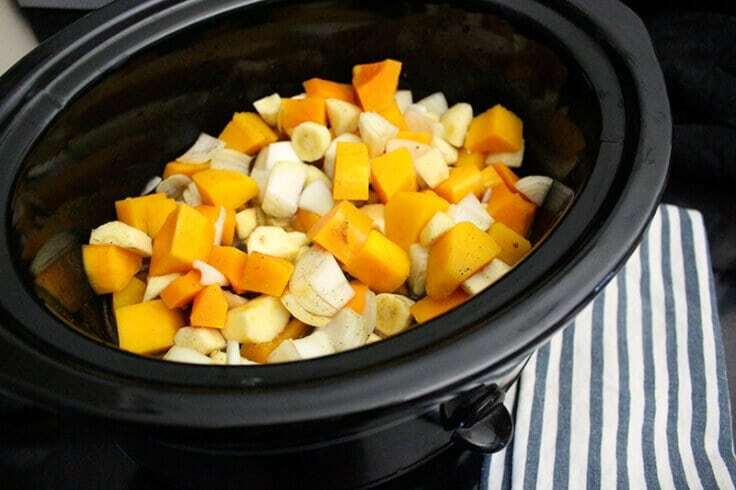 It’s Amanda from Life at Cloverhill with an easy seasonal slow cooker soup recipe. Root vegetables and squashes are still readily available in most parts of North America during the winter, making them a great way to support local farmers in the colder months. This soup gets its subtle peppery taste from the heat of the parsnips. If you’ve never had them before, they’re like the slightly spicy and nutty cousin of the carrot. 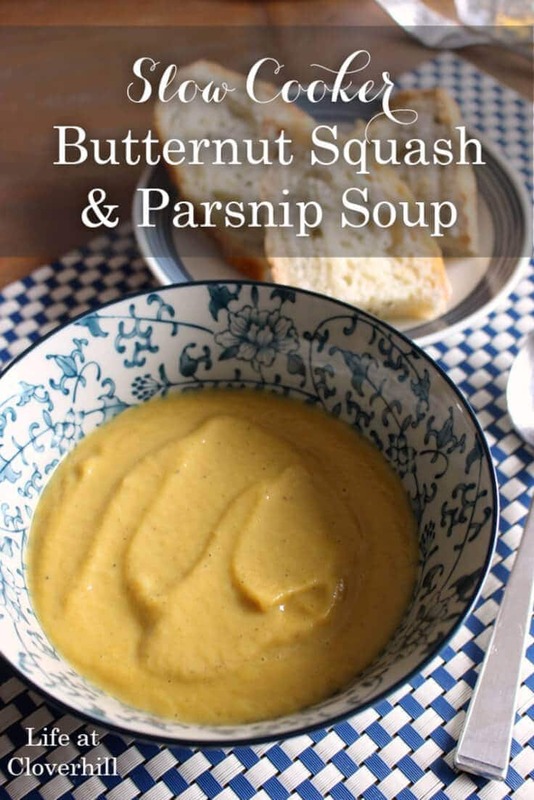 Paired with the sweetness of the butternut squash and a heavy dose of cream, this creates a smooth soup that’s full of flavour. 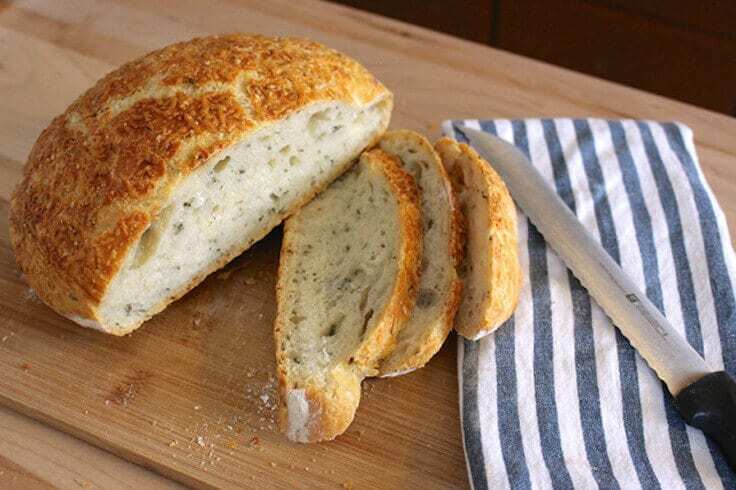 I served my soup with a nice loaf of my favourite Rustic Rosemary Parmesan No Knead Bread. I just prepped the dough the night before (took all of 2 minutes) and then popped the bread in the oven right before the soup finished up in the crock pot. A delicious homemade meal that tastes fantastic with little effort – my kind of weeknight dinner! I recently learned a great trick for peeling and chopping butternut squash. 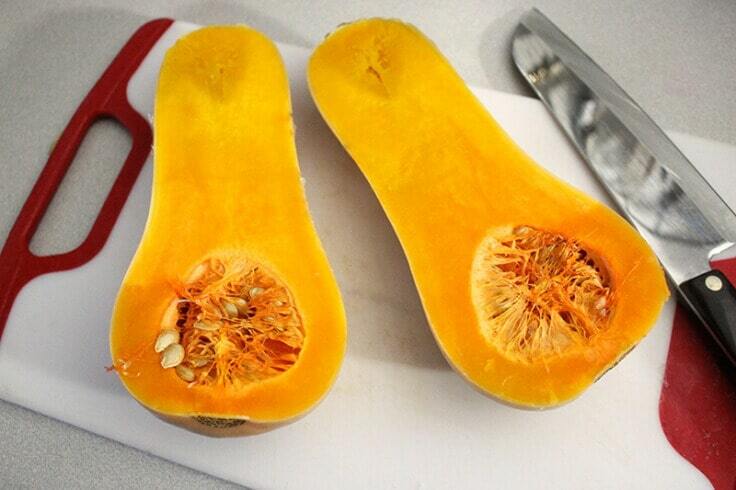 Make several slits along the skin of the butternut squash and place it on a microwave-safe plate. Microwave on high for 3-5 minutes to soften the skin. Let it rest for 1-2 minutes until it’s cool enough to handle. Peel the outside with a knife or peeler, then cut lengthwise, scoop out the seeds and chop. This makes it so much easier and safer to chop the butternut squash. I love making a slow cooker soup like this on days when we’re heading out to run errands. By the time we get back in from the cold, the vegetables are soft and tender. All that’s left is blending them up and adding some cream. Once cooked and the vegetables are soft, puree in a blender in batches until smooth. Make sure to vent your blender and cover the top with a clean tea towel to prevent splatter. Return soup to the pot and stir in cream. 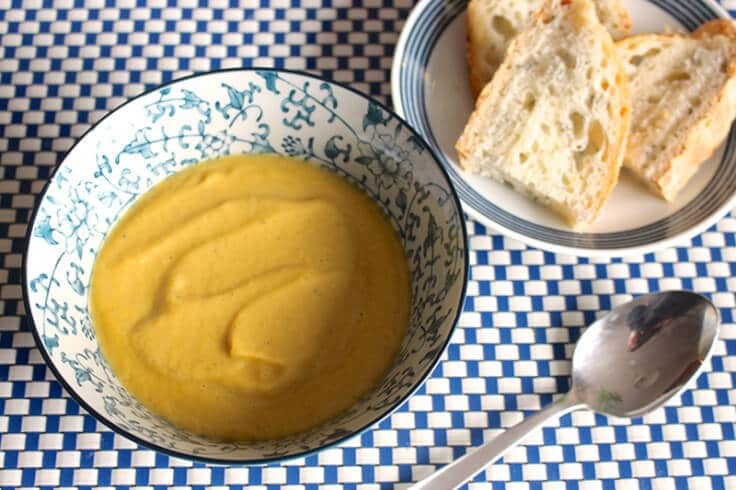 I made a batch of this soup and a loaf of bread to take to a friends’ house for lunch one day. It was so easy to reheat the soup in a small saucepan. 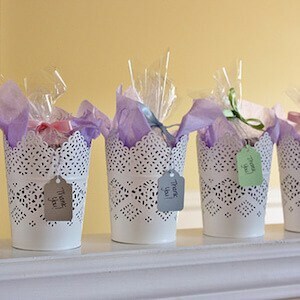 It would be a nice surprise for someone on the mend, paired with a DIY Get Well Soon Basket. Amanda is the lifestyle blogger behind Life at Cloverhill. Along with her husband, she is restoring Cloverhill, a 1903 farmhouse in rural Ontario, Canada. They share their small homestead with their young daughters, two rambunctious dogs, four hens and a persnickety rooster. When she isn’t creating new projects and developing delicious recipes, Amanda can be found outside in their flower field. 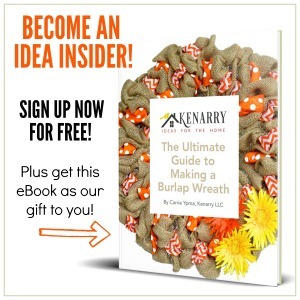 Amanda was part of the Creative Team on Ideas for the Home by Kenarry™ from October 2016 - September 2018. Follow Amanda on Facebook, Twitter, Pinterest and Instagram.